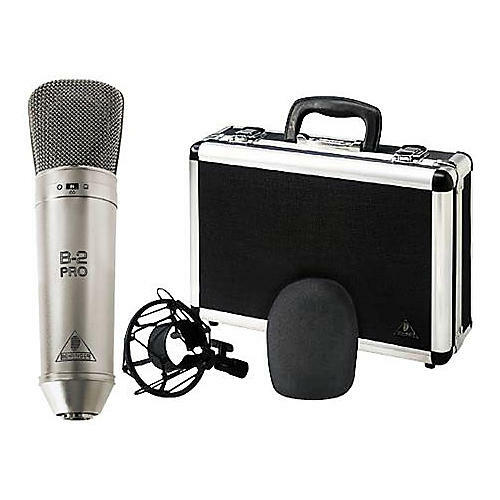 The Behringer B-2 Pro Condenser Microphone provides transparency usually found only on high-end large-diaphragm condenser microphones. Features selectable patterns, low-cut filter (6dB/octave at 150Hz), and built-in shielding. A 10dB attenuator can be used with high-volume signal sources. Frequency response of 20Hz-20kHz. Signal-to-noise ratio up to 77dB cardioid, 76dB omnidirectional, and 78dB figure-8. Rugged hard case, suspension mount, and windscreen included. 1 year warranty. 3 year warranty if registered within 90 days of purchase.